1. To make the home-made pineapple purée, place all of those ingredients into a saucepan. Bring to a boil while stirring until all the pineapple cubes break down. Remove from heat and allow cooling. Remove lemon zest and vanilla bean and pour into a “store and pour” container. Keep refrigerated until use. 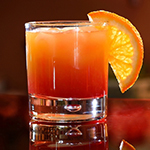 For drink, put all ingredients into a slushy machine, wait for a consistent pour and add into a hurricane glass.